Substrate surface condition prior to bonding.Definitions of what contributes to a good surface prior to bonding vary. However standards developed over the past thirty years can help considerably. Standard testing of bonded lap joints that have been aged in both real and deliberately harsh environments has yielded a considerable amount of data. This data can now be used to determine the affect of different surface preparations on the ageing properties including the strength of bonded joints. That the surface is readily wetted by the adhesive used. A surface that has either not been prepared or has been partially prepared will not wet readily. 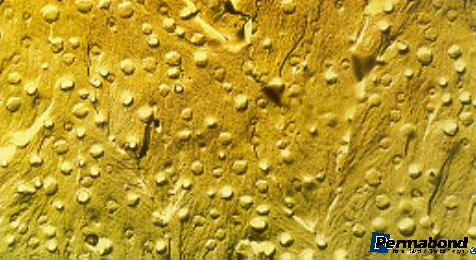 This is indicated when the control solution is applied and remains as small droplets on the surface not forming a continuous film. This condition indicates a failure in the production process prior to bonding that will reduce both the chemical linking (strength) and life of the joint.A more familiar analogy is that of water droplets at the bottom of an oiled / teflon frying pan. These droplets do not evenly wet the surface of the pan. Another example is to consider a dry car windscreen . Coated with a film of oil, diesel from road traffic and maybe some wax from just being polished. When it rains the first few drops form droplets on the glass surface that smear when you switch on the wipers. That is the water droplets do not wet the glass. It is only with the use of detergent in the windscreen wash/wipe that the oily film is broken down and the water forms an even film that you can see through again. Good molecular linking with the substrate surface. Here it is important to appreciate the microscopic scale between :1*10-10 m> 1*10-9 m. which is on a molecular scale. Chemical linking takes place at this scale and yet the best metal surface finishes are an order of 103 >104 times larger. This is the scale where it all happens and is well outside the visible human scale without the use of an electron microscope. Using a liquid adhesive fills in the huge spaces between the two mountain peaked surfaces of the materials to be joined. Setting up a high distribution of shared chemical linkages and bonds. These bonds grow wherever there is direct contact with the material substrate . That the adhesive wets the surface of the substrate indicates that the initial chemical links will be established over the whole surface and leaves the minimum surface area on the substrate for moisture to enter and reduce the chemical bonding within the adhesive. Thoughened structural adhesive systems are used extensively in the aerospace industry for both aircraft and space structures. Thoughening removes the brittle nature of standard adhesives more commonly available. By incorporating a suspension of very small rubber particles that absorb the propogation of micro cracks through the adhesive interface.